Crawling from the panorama of Long Beach, California is a quartet which enjoys battling the mainstream and following a path which is their own. 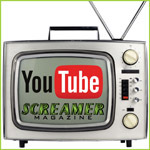 Screamer Magazine doesn’t just celebrate and investigate established bands, but also enjoys stumbling across new talent and artists who venture into the wild on an independent basis. Cutting through the bravado, angular and jagged shapes are thrown by tracks like I Know You Don’t Know, 5 Alarm and album-opener A Black Light which get in, do their thing, and finish without elaboration or superfluous additions. One of the magic ingredients to the sound of The Black Lantern is the bark of lead vocalist Wendy Faraone who is bubbling over with conviction in her punk-riddled diatribes. 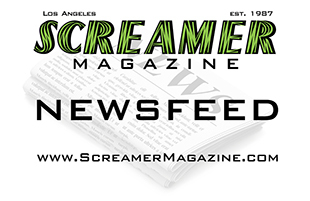 The musical backdrop is raw with filthy distortion and the overall sound of a band in a dark cellar assembling and crafting their audible expressions of discontent. There is a strut and bounce to tracks like Bleed it Out once it gets going and Helicopter which sandwich the stammering Anthropomancy and the furious flash of On Your Knees. This quartet consisting of Russell Crain wielding bass, the previously mentioned vocalist Faraone along with Jesse Nason beating the proverbial out of his drums plus guitarist Andy Prickett tackle and update the Huey Lewis and the News track I Want A New Drug by removing any of the 80’s gloss which surrounded the original, and filling in the space with a sizzling energy. The band themselves state “What you hear is four people making a sound that they can only make together, and only at the same time.” We Know the Future is like an exciting high-speed car chase with police cars colliding with other vehicles in pursuit of a dangerous leopard heading down a street in San Francisco! Glorious in its dirty and fuzzy sound and wallowing in attitude and opinion whilst shaking the street lamp outside the building, this is the new flesh; the anti-establishment and the antithesis of sterility. Keep an eye on this band as the future is dark like a black lantern and full of poisonous potential, which feed off the constantly negative society and surroundings we currently face on a daily basis. They know the future; do you?